We all do it. We tell people “I’ll pray for you”, but do you always actually do it? It’s easy to say but not always easy to remember. 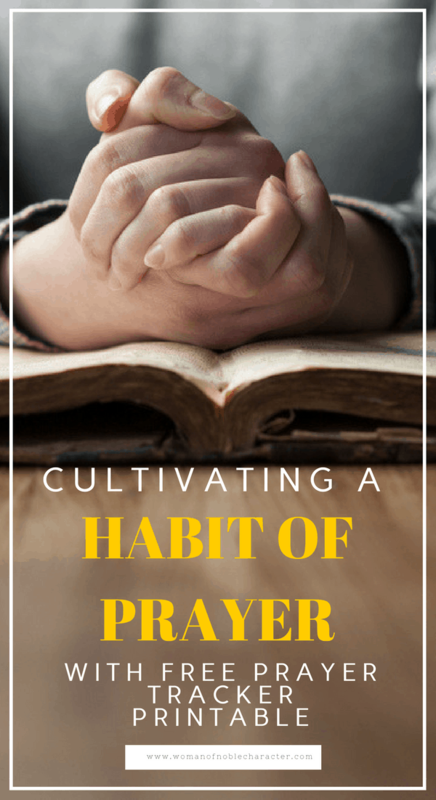 I have some tips for you to help you cultivate a habit of prayer. (For How to Pray According to the Bible, see this post). Forming any habit requires that you take action and commit. Commit for a minimum of 30 days. Some experts claim that it takes 21 days to form a habit. Others claim that it takes much longer, up to 60 or more days. The truth lies somewhere in the middle. It is dependent on the person and the habit. Some habits (like exercising) are easier for some people to develop than others. You will always have obstacles – a crying baby, an illness, a chaotic schedule. Plan around these things. 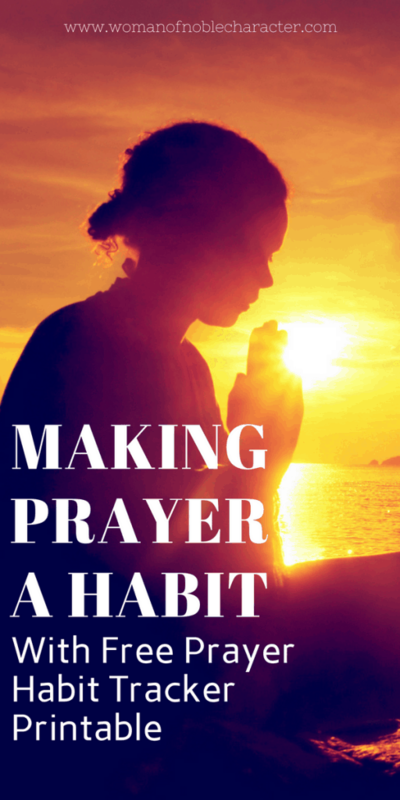 Forming a habit, including daily prayer is a choice that you make. It may seem odd to ask God to help us pray to Him, but honestly, we need Him for everything, prayer included. Ask Him to help you pray, to help you form a habit of prayer. 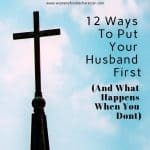 Ask Him to change your heart, particularly if you are resistant to praying regularly. He will help you pray. To change your heart and become joyful about the privilege of praying. The Bible is God’s Word, written for us. It is a place of encouragement. A manual of life. It is His infallible Word. Cultivating a habit of prayer must begin with being in His Word. Throughout the Bible, we can find prayers written from the heart from David, Solomon and so many others who have come before us. We can learn to pray scripture and open our hearts and minds to what He would have us see. In this article by The Gospel Coalition, we read why we should pray the Scriptures. It is a great article that I encourage you to check out. Do you have a Christian friend who can help you stay accountable? Can you commit to check in daily by phone or text to remind and encourage each other to pray? You can also share prayer requests with this person or pray with them.. Sometimes just the act of writing things down will help you to remember who and what to pray for and remind you to do it. I use a prayer journal and, when asked for prayer, write it in my journal. When I do my morning devotions, I refer to my prayer journal and pray over each need. I also use it to jot down any specific prayer requests that come to mind. I always pray for my husband, my kids and my grandkids but here I can write down any other prayer requests that come to mind. 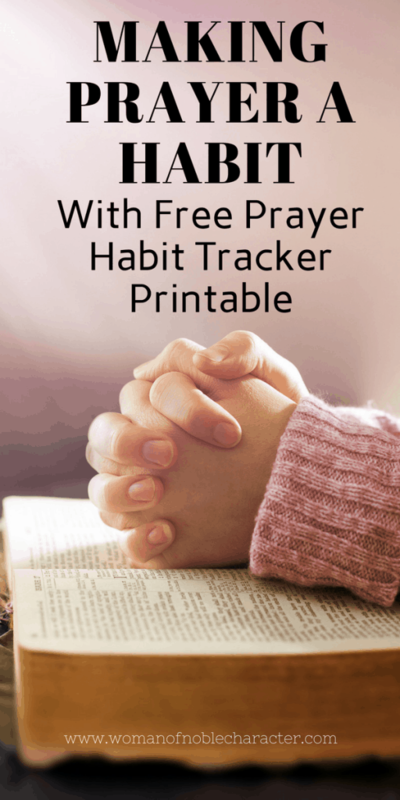 You may also choose to use a prayer tracker, either in a bullet journal or printable tracker. 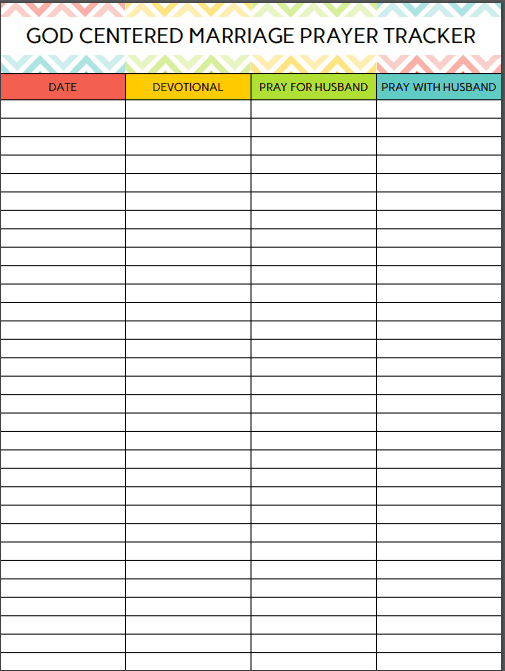 Below, I have a prayer habit tracker for you to remind you to pray FOR your husband, to pray WITH your husband and do you a daily devotional or Bible study time. Feel free to adapt it to your needs. 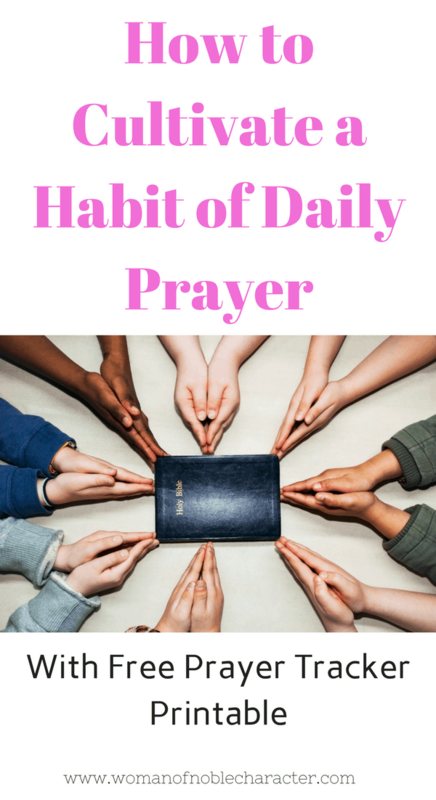 Do you pray daily? 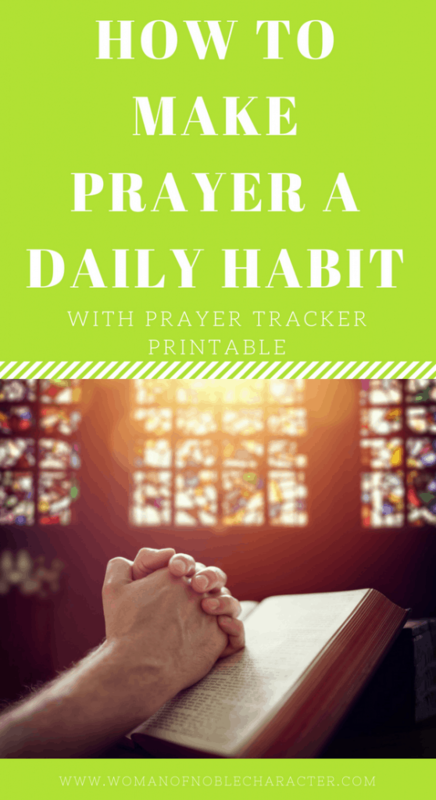 How can you make prayer a habit? 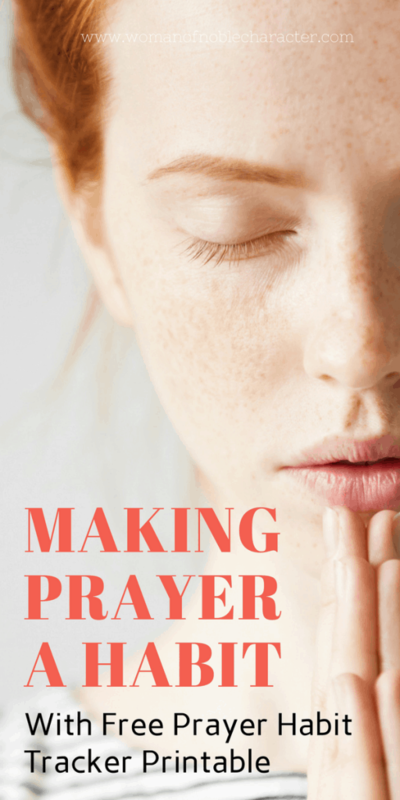 Which of these ideas about making prayer a habit resonated with you the most? I’d love to hear from you! I have to admit I’m a firm believer in prayer. I find that if I miss a day of prayer for whatever reason, my day is off. Making God first in my life is the best way to start my day. That is a wonderful thing! I have coffee with God every morning and He guides my steps throughout the day. Thank you for stopping by!